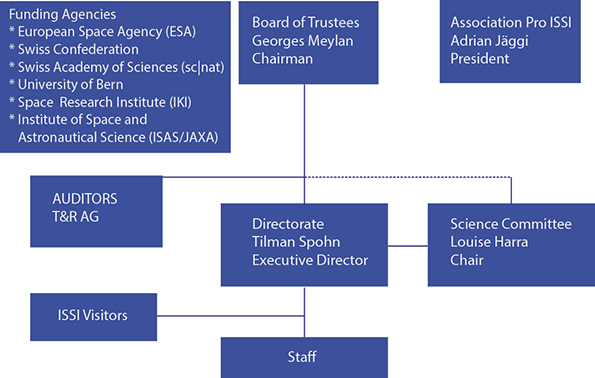 The Board of Trustees oversees the work accomplished by the institute, exerts financial control, and appoints the ISSI Directors and members of the Science Committee. The members of the Board of Trustees are of the representatives of the Founder and of the funding agencies. The ISSI Directorate is in charge of the scientific, operational and administrative management of the International Space Science Institute. It interacts with the Space Agencies, the Swiss authorities, the Board of Trustees, the Science Committee and the Association Pro ISSI. The Science Committee is made up of internationally renowned scientists. It supports the Directorate in the establishment of the scientific agenda, e.g., evaluating the scientific team proposals of the Annual Call. The Association Pro ISSI under the direction of the Board of the Association Pro ISSI promotes the ideas of ISSI to the Swiss public and the science community by organizing public lectures and events in Switzerland where internationally known space scientists present their findings. Summaries of these talks are published in the journal "SPATIUM".